Today was a glorious day to begin The Wildlife Trusts 30 Days Wild initiative for 2016. I spent a large portion of the day working in the Youth Project garden, under fab sunshine, weeding, watering and tending to planters and the raised beds of veggies we are attempting to grow. I’m not a gardener by any stretch of the imagination, but I do enjoy pottering about, and its great to see and learn a little more about your own little “patch”. Gardening is a terrific way to get hands on and explore, and it never fails to uncover something interesting; snails, centipedes, caterpillars, and millipedes, as well as uncovering all manner of little interesting grubs. The gardens are full of the sounds of feathered visitors. Overhead, swifts scream at height, and young swallows teeter on the telephone lines that straddle the yards. Starlings and house sparrows are nesting in the eaves of the old building, and it’s a lot of fun to watch the chirpy characters with beakfulls of bugs popping back and forth. While weeding I noticed a male blackbird keeping a close eye on me from the roof, head cocked to the side and singing. I paused to watch him as he hopped to the ground, hoovering up the critters exposed by my digging, before delving into the privet. Tiny chirps greeted his arrival, and shortly he reappeared to launch himself accepted the lawn and out to the meadow. 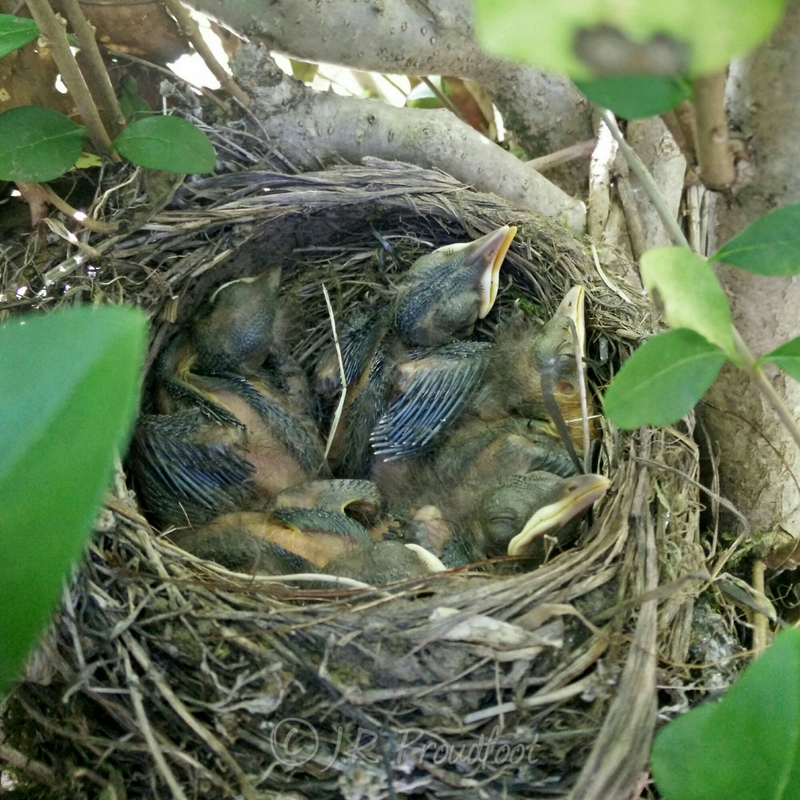 I peeked into the hedge, hoping to spot a nest and, sure enough, a small cupped bowl with five chicks. I left them well alone but, with the nest only a few metres from my office window, I’ll be keeping a close eye on these little guys as they develop and hopefully fledge soon (:Update: They fledged only ten days later, on 10th June!). A great start to begin my #30DaysWild adventures!